Paddleboarding can be a great experience with lots of wild adventures. It’s a growing sport with a variety of activities available like surfing, yoga, racing, and touring. However, for whatever reason you are out on the open water, safety should always be the number one priority. Wearing the right personal flotation device (PFD) for paddle boarding might mean the difference between life and death. Safety is a priority, but it doesn’t have to get in the way of the fun times. Being able to paddle without chafing the skin off your arms or be restricted in movement is the difference between a good life vest and a great one. You also want a life vest that can fit over your body and feel snug. Bigger individuals with bellies will want a vest that can fit over their chest without popping off and needing to be pulled down from time to time. Skinnier people with smaller frames will want one that can be tightened sufficiently without feeling loose. 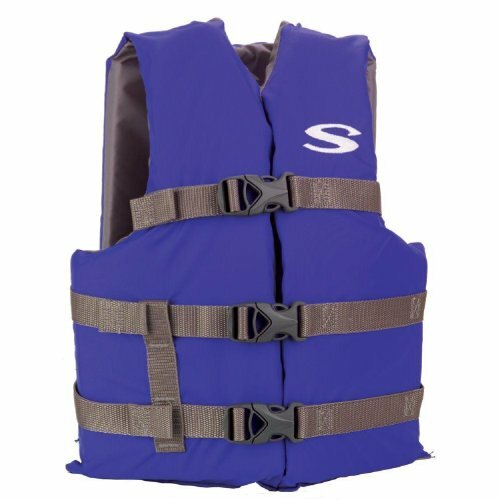 Most PFDs come with adjustable buckles and straps, with multiple sizes for the chest area to help fit all types of body sizes. Finally, the paddle board PFD should be able to keep you afloat when you fall out of the water with sufficient buoyancy. In this buyer’s guide, we look at what makes a great PFD for paddle boarding and recommend the top 5 best PFD for SUPs. 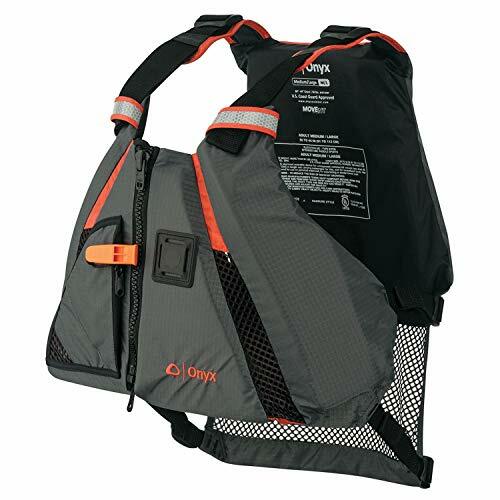 The Onyx MoveVent is a PFD made with heavy duty denier with nylon ripstop and nylon oxford. These two fabrics help prevent tearing from spreading while giving the fabric flexibility. The shoulder adjustments are padded with neoprene for comfort and durability. The backside uses a mesh drainage design on the lower back to keep the vest in place. There is also a lash tab for small accessories, an attached whistle, and an expandable zippered pocket with mesh drainage. The vest also comes with three different sizes for chest sizes between 28″ to 56″ (size chart is available on the next page). 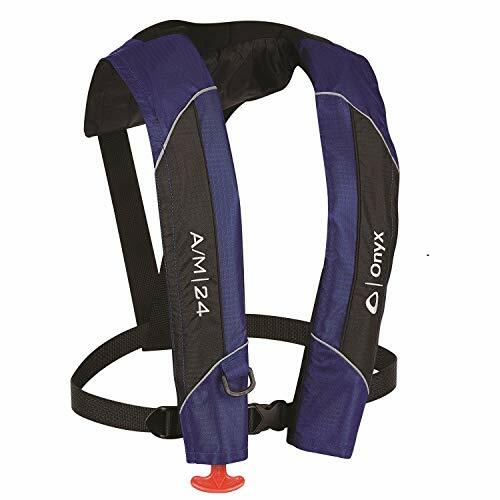 The Onyx A/M-24 is an inflatable life jacket that automatically inflates when you fall into the water from your paddle board. Made of soft neoprene neckline and durable tear-resistant fabric, this vest is designed to support people over 80 pounds. It has both an automatic inflation and a manual inflation both using a CO2 cartridge to inflate. When inflated, a yellow vest will pop out around your chest and neck. This vest is great if you want a lightweight design that barely gets in the way of your movement. It also goes over almost any clothing. 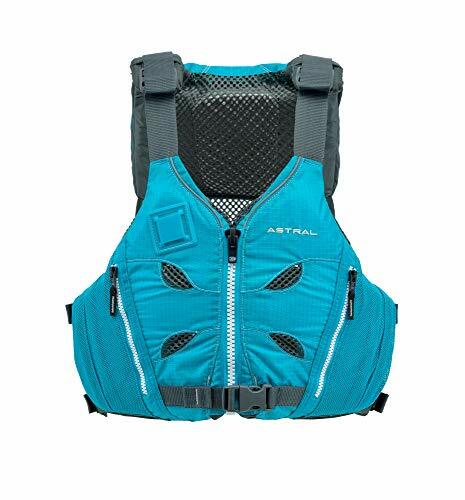 The Astral V-Eight is front center zipper life jacket made with heavy duty denier ripstop nylon shell and a breathable polyester mesh liner on the interior. PE and EVA foam inserts are along the rib area when worn and on the back of the neck. The zipper is a self-locking teeth, with heavy duty acetal hardware that is waterproof. There are pockets available on both sides, and it comes in three different sizes ranging between 31 inches to 51 inches around the chest. The Onyx M-24 Belt is a manual inflatable jacket that is compact and lightweight. It is secured inside the belt, and pops out when the handle is pulled. The belt is a very convenient design allowing for complete freedom of movement. It uses a CO2 cartridge to inflate with the pull of a T-cord attachment. As a back-up, an oral inflation tube is part of the vest that pops out of your belt. There is also a zippered pocket for storing small personal items. The Stearns Adult Classic is a unisex vest made with nylon with PE foam. It uses a classical design with foam paddings on both sides, with three buckles across the chest for securing across the body. There isn’t anything fancy about this design, but it offers sufficient movement freedom of the arms for paddling activities. It goes without saying buying a brand that isn’t respected by the community is going to lead you into trouble. Although there are many PFDs that are USCG-approved, we want to choose a model that is suitable for your activity that won’t get in the way of your fun and cause your grief. The best way is to follow the crowd’s most popular pick and best sellers online. Paddleboarding is a sport that demands your full body. A lot of paddlers go without a PFD because they tend to get in the way. That’s why we did our best to pick the best ones that give you the space and comfort you need to enjoy paddling activities without getting in your way. First off, the arms must be free to do what they can. When you are off on a paddle board, you should be able to paddle with obstruction to your shoulder area. Paddling requires a lot of effort over a long period of time, so the last thing we want is to put resistance to it. Some PFDs will use thin, padded shoulder straps that are just enough to hold the life jacket in place without it falling off or sliding around on your shoulders. They should also have a free open area underneath the arm pits, around the chest, to prevent chafing for the arms. Rubbing the inside of your upper arm against your life vest as you paddle isn’t fun. Secondly, some paddlers, especially yoga enthusiasts, will want to have their hips free for movement. When you kneel down or sit down to cross your legs on your paddle board, the life vest shouldn’t be digging into your thighs or hips. Longer PFDs might offer better flotation, so this is a trade-off to keep in mind. However, if you are getting up and down from your board frequently, then the last thing we want is for your life vest to chafe your hips. Lastly, some PFDs might be restrictive to breathing by place pressure against your chest and back. In general, life vests are lightweight and add only a pound of weight at most pulling down from the shoulders. However, there are ones that are built to be closer to the chest. Air circulation is something to contend with if a life vest feels too tight. For men and women, the feeling of their vest chafing their body isn’t a pleasant one. What we want to lok out for is extra padding that allows for decent air circulation without putting unnecessary resistance against your breathing. Adjustable straps for the chest and bottom half of your vest is a great feature. You can loosen and tighten according to your need and body type without feeling weight to your chest. Depending on what you are using your paddle board for, your best bet is to choose the right life jacket that will keep you safe. The use case for a paddler near the shore doing yoga is entirely different from a paddler doing long distance touring or fishing far from the coast and out in the ocean. Type 1: These are offshore life jackets where rescue may take a while. They are bulky and the most buoyant, bright colored vests that will turn to keep unconscious people face up in the water. Type 2: Great for calm inland water and near-shore use where rescue can be quicker. They will turn unconscious people face up often, but not always depending on the person’s body type. These are bulky, but not as much as Type 1. Type 3: These are suitable for paddlers where there is a chance for a quick rescue. There is a lot of freedom of movement and are comfortable for long periods of wear. Much of the buoyancy is on the front to turn the person face up, but does require tilting your head back to avoid going face down. Type 4: These are throwawable devices like cushions or ring buoys. They act as backup to a PFD and are absolutely not for non-swimmers, rough waters, or unconscious people. These are not required for canoes or kayaks. Type 5: Special-use devices. These are PFDs designed for specific activities. They have to be activity-specific on the label and tested by the USCG in order to be approved. Some example activities with specific Type 5’s include kayaking, waterskiing, windsurfing, hybrid vests, and deck suits. Most paddleboarders only need Type 3 and Type 5. Type 3 gives you the freedom of movement you need for paddling while Type 5 can do the same, specifically designed for paddleboarding. Pockets for storing items: Some paddlers will want to carry a safety whistle for calling for help. Fishers will want to carry their license. Although most PFDs don’t offer waterproof pockets, they can have zippers to prevent your items from falling out. Reflective material for visibility: Paddlers who go out in the night will need a life jacket that have reflective points on it in the event of an emergency. Even if you don’t paddle at night, being seen when there is an emergency can mean the difference between life and death. 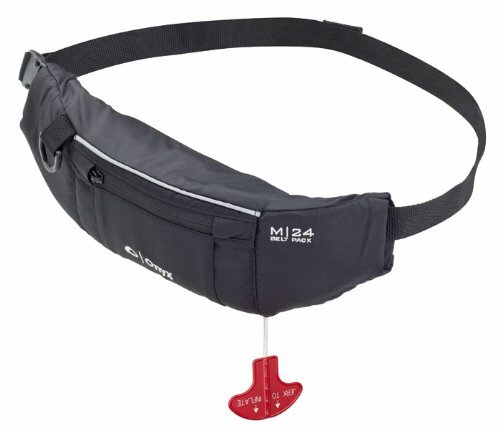 Adjustable shoulder and waist straps: Most life vests are designed to be universal with adjustable straps. This lets the vest to be tightened and snug for all body types. Picking the right paddle boarding PFD can be challenging with so many designs available on the market. There are a handful of decent ones that will let you paddle without feeling restricted and keep your safe when an emergency arises. In this guide, we look at what makes a decent PFD for paddleboarding and the top 5 we believe are suitable for the sport. We hope this guide has been useful for you and help decide on the best SUP PFD for you.